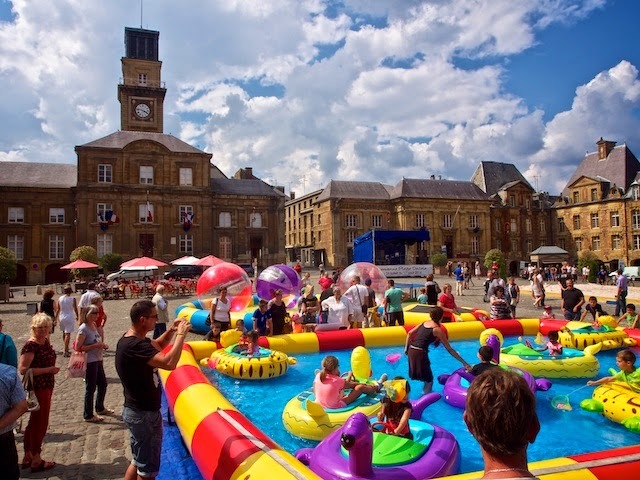 In a week the town square in Charleville had been transformed to a place of summer celebration. When we walked through it last week, it was an empty space, hot and barren in the summer sun and paved with ancient cobblestones with a Carousel revolving endlessly in an apparent attempt to relieve the the spirits of those traversing the square. Today, it was filled with sand and beaches and volleyball and badminton and pools with boats and plastic ducks and children playing and swimming and driving bumper boats. The inflatable bumper boats really spoke of summer. What a joy it must be to cruise in a vessel so reliable and vibration free! We shouldn’t complain. Our Mr P had brought us back after all, with only a few hints of protest along the way; a few minutes of belligerence every now and then to shake us out of our complacency. Even the normally unflappable Jacques seemed nonplussed at this behaviour, but it wasn’t enough to spoil our somewhat idyllic day with Maggie and he. Perhaps still one more round of tightening is in order. We noted with something akin to envy that not one of those kids had grease under their fingernails. Perhaps we could just give up our quest for reliability aboard, and trade our entire catastrophe for one of those little bumper boats!